Epilogue: When might we go back to the Moon? First, though, we're returning to the Moon. "The Moon is a natural first step," explains Philip Metzger, a physicist at NASA Kennedy Space Center. "It's nearby. We can practice living, working and doing science there before taking longer and riskier trips to Mars." The Moon and Mars have a lot in common. The Moon has only one-sixth Earth's gravity; Mars has one-third. The Moon has no atmosphere; the Martian atmosphere is highly rarefied. The Moon can get very cold, as low as -240° C in shadows; Mars varies between -20° and -100° C.
Even more important, both planets are covered with silt-fine dust, called "regolith." The Moon's regolith was created by the ceaseless bombardment of micrometeorites, cosmic rays and particles of solar wind breaking down rocks for billions of years. Martian regolith resulted from the impacts of more massive meteorites and even asteroids, plus ages of daily erosion from water and wind. There are places on both worlds where the regolith is 10+ meters deep. Operating mechanical equipment in the presence of so much dust is a formidable challenge. Just last month, Metzger co-chaired a meeting on the topic: "Granular Materials in Lunar and Martian Exploration," held at the Kennedy Space Center. Participants grappled with issues ranging from basic transportation ("What kind of tires does a Mars buggy need?") to mining ("How deep can you dig before the hole collapses?") to dust storms--both natural and artificial ("How much dust will a landing rocket kick up?"). Answering these questions on Earth isn't easy. Moondust and Mars dust is so ... alien. Try this: Run your finger across the screen of your computer. You'll get a little residue of dust clinging to your fingertip. It's soft and fuzzy--that's Earth dust. 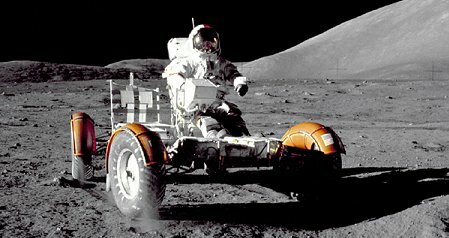 "Even after short moon walks, Apollo 17 astronauts found dust particles had jammed the shoulder joints of their spacesuits," says Masami Nakagawa, associate professor in the mining engineering department of the Colorado School of Mines. "Moondust penetrated into seals, causing the spacesuits to leak some air pressure." 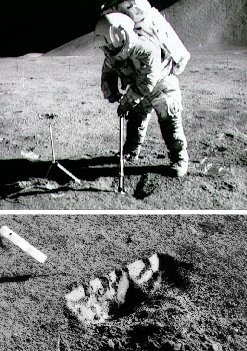 In sunlit areas, adds Nakagawa, fine dust levitated above the Apollo astronauts' knees and even above their heads, because individual particles were electrostatically charged by the Sun's ultraviolet light. Such dust particles, when tracked into the astronauts' habitat where they would become airborne, irritated their eyes and lungs. "It's a potentially serious problem." For these reasons, NASA is funding Nakagawa's Project Dust, a four-year study dedicated to finding ways of mitigating the effects of dust on robotic and human exploration, ranging from designs of air filters to thin-film coatings that repel dust from spacesuits and machinery. The Moon is also a good testing ground for what mission planners call "in-situ resource utilization" (ISRU)--a.k.a. "living off the land." Astronauts on Mars are going to want to mine certain raw materials locally: oxygen for breathing, water for drinking and rocket fuel (essentially hydrogen and oxygen) for the journey home. "We can try this on the Moon first," says Metzger. Both the Moon and Mars are thought to harbor water frozen in the ground. The evidence for this is indirect. NASA and ESA spacecraft have detected hydrogen--presumably the H in H2O--in Martian soil. Putative icy deposits range from the Martian poles almost to the equator. 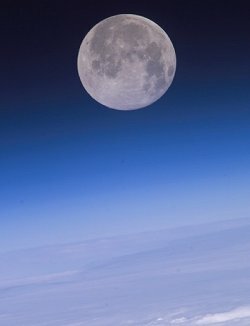 Lunar ice, on the other hand, is localized near the Moon's north and south poles deep inside craters where the Sun never shines, according to similar data from Lunar Prospector and Clementine, two spacecraft that mapped the Moon in the mid-1990s. If this ice could be excavated, thawed out and broken apart into hydrogen and oxygen ... Voila! Instant supplies. NASA's Lunar Reconnaissance Orbiter, due to launch in 2008, will use modern sensors to search for deposits and pinpoint possible mining sites. "The lunar poles are a cold place, so we've been working with people who specialize in cold places to figure out how to land on the soils and dig into the permafrost to excavate water," Metzger says. Prime among NASA's partners are investigators from the Army Corps of Engineers' Cold Regions Research and Engineering Laboratory (CRREL). Key challenges include ways of landing rockets or building habitats on ice-rich soils without having their heat melt the ground so it collapses under their weight. So ... to Mars! But first, the Moon.